Southmead Hospital consultant Seema Srivastava is one of 18 senior health professionals in the UK to be selected for GenerationQ, a pioneering leadership programme from independent health care charity the Health Foundation. The GenerationQ programme develops Fellows to drive forward and influence improvements across health services and organisations. 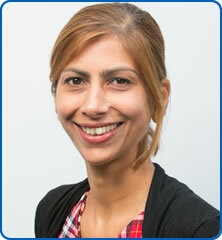 Seema said: "I am passionate about improving the quality of care we provide for patients across North Bristol NHS Trust and am thrilled to have been selected to be part of the GenerationQ fellowship programme. Seema is Associate Medical Director for Safe Care at North Bristol NHS Trust and was awarded an MBE in the Queen's New Year Honours. She has worked at the Trust since 2008 and is a Consultant in Medicine for Older People and also the lead Consultant for safety and quality improvement. She led the development of a combined ‘National Early Warning Score (NEWS) and Pain’ chart across the Trust, which helps the early identification of patients at risk of deterioration, thereby ensuring early intervention. GenerationQ provides an innovative learning experience structured around four leadership domains. The challenging programme includes residential leadership forums, executive coaching, action learning in peer groups and the opportunity to engage with systems beyond health. Fellows undertake an 18-month part time programme to complete a postgraduate certificate in leadership (Quality Improvement) with the option to complete an MSc. Fellows will develop personal and relational skills and strategies, equipping them to confront the multitude of challenges facing health and health care today. They will also lead a significant improvement project in their organisation or system.